Paths in Healing is passionate about helping people of all ages and physical abilities. That passion is rooted in our fascination with the human body and the spirit that inhabits it. We want to inspire individuals like you to achieve the lifestyle that you want. Your goal may be a more efficient marathon or it may be freedom from pain after years of suffering. We expand hope by uniting and balancing body, mind and spirit. Through sharing knowledge of the human body and how it functions, we create opportunities for people to evolve into optimal health. Nationally Licensed Massage Therapist of N.C.T.M.B., (National Certification in Therapeutic Massage And Bodywork) Neurosomatic Therapist, Certified Orthopedic Massage Therapist, CHEK Holistic Lifestyle Coach-Level 3. He has actively been involved with massage and bodywork since 1992. Coming from a school that primarily worked on athletes, Tim Sr worked with athletes of all levels for a number of years. After a period of years he extended his work to the use of Myofascial Release, Neuromuscular Therapy, Craniosacral Therapy, Sound and Vibration, and other forms of energy work. Today he incorporates Neurosomatic Therapy, and other forms of bodywork to restore balance, flexibility, strength and optimal movement. Tim Sr works with clients of all ages and challenges. He is a Holistic Lifestyle Coach and believes that the true balance of the body (mind, body, and Spirit) achieves health. He also works with Pre-surgical and Post-surgical clients to restore pain free movement. 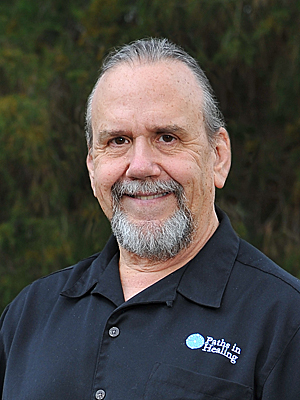 Tim is a Integrative Neurosomatic Therapist (NeuroSomatic Educators), Certified Orthopedic Massage Therapist (James Waslaski), Holistic Lifestyle Coach level 3 (CHEK Institute) Massage Therapy Instructor (MI 1986) and Texas CE provider (CE 1863). He has been coaching clients on improving their health since 2006 and has helped numerous clients achieve a lifestyle of healthy movement and vitality. He uses his knowledge of functional movement to increase performance and prevent injury in Crossfit, running, cycling, golf, lacrosse, horseback riding, motocross, MMA, gymnastics and other various sports. He is an expert in improving function and balance and preventing injury for athletes of all types and ages. David was in the graduating class of 2013 at Cypress Ridge High School. It was during his high school marching band career he was introduced into the benefits of massage therapy. Shortly after high school he enrolled into The Phoenix School of Holistic Health and Massage and became a licensed massage therapist at the end of 2014. David is sports massage certified through Texas Massage Educators and is currently studying through Neurosomatic Educators.